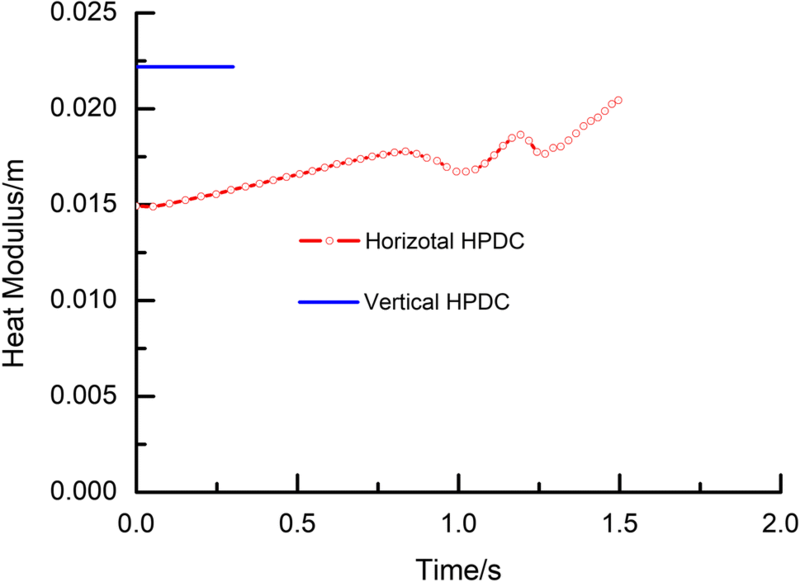 The effects of different casting parameters on porosity defects between the horizontal and vertical shot sleeve processes are quantitatively studied based on experiments and simulations. The castings made using the two processes are characterized in terms of porosity defects by X-ray radiographic inspection and blistering formation by T4 heat treatment process. Experimental results indicate that much fewer porosities and blisters are formed in the castings made using the vertical process than those made using the horizontal one. 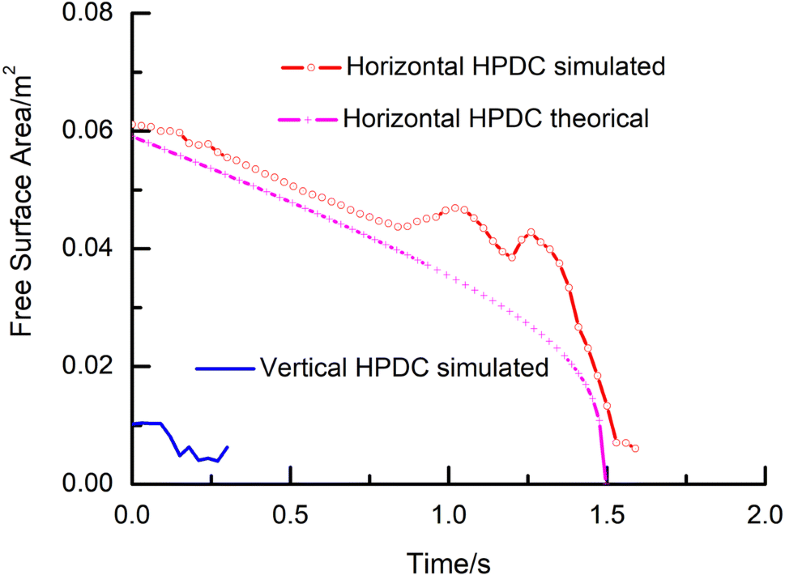 Meanwhile, numerical simulations have been performed to quantitatively investigate the flow dynamics behavior of molten metal in the horizontal and vertical shot sleeves. The simulation results demonstrate that compared with the conventional horizontal process, the vertical shot sleeve process is more efficient in elimination of waves and reduction of air entrapment and oxide formation. Moreover, the vertical process needs a lower pouring temperature which can decrease hydrogen solubility in the molten metal; it has a smaller temperature gradient of molten melt which can reduce the formation of cold flakes and pre-solidified materials. Therefore, the vertical shot sleeve process is more competitive in improving the internal integrity of die castings. Some studies have been conducted on porosity defects in the HPDC process. Tian et al.6 studied the effect of melt cleanliness on porosity formation and identified the types of inclusion: amorphous oxides, oxide films, and sludge particles. 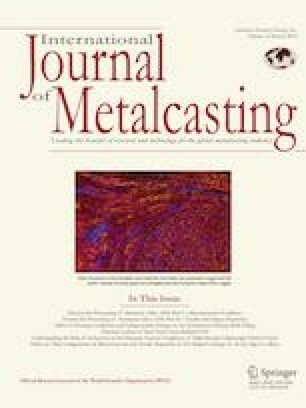 Tsoukalas et al.7 evaluated the effect of die casting machine parameters on porosity, and the results indicated that multiplied pressure in the third phase has the most significant effect; plunger velocity in the second phase, die cavity filling time, and fast shot set point also have a significant effect. 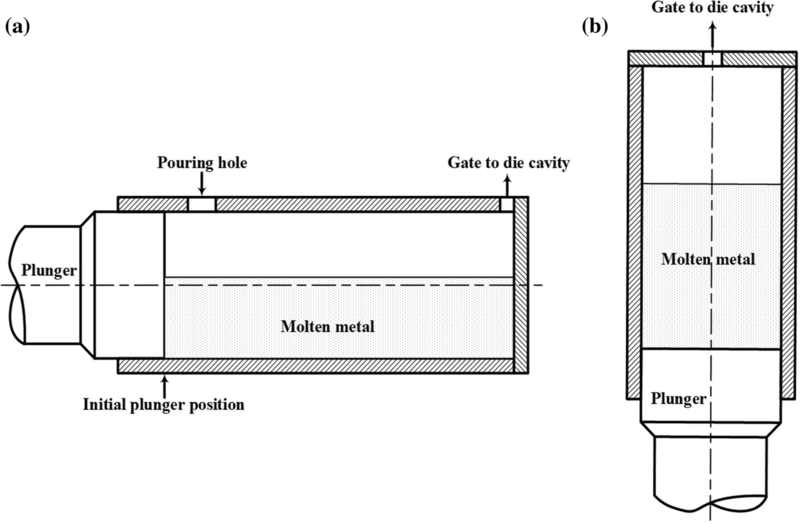 Lee et al.8 investigated the effect of process parameters on porosity distributions, and the results showed that a decrease in both gate velocity and melt temperature can decrease the total amount of porosity. 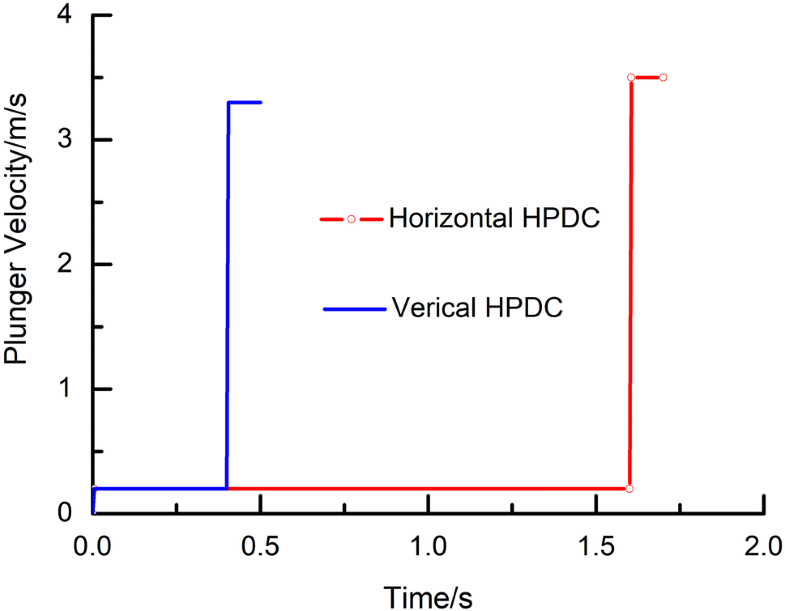 Dispinar et al.9 studied degassing, hydrogen, and porosity phenomena in the A356 alloy, and they pointed out that the decrease of hydrogen solubility in liquid aluminum with temperature is believed to be a major source of gas porosity. It is well known that the conventional HPDC machine used in the foundry is equipped with a horizontal shot sleeve, as illustrated in Figure 1a. The shot sleeve is only partially filled with molten metal when pouring finished. Meanwhile, there is another type of HPDC machine equipped with a vertical shot sleeve, as shown in Figure 1b. The molten metal always covers the entire top of plunger because of gravity, and this is equivalent to the total fill of a shot sleeve for a horizontal HPDC process. The vertical shot sleeve is placed under the dies; it sways out to receive molten metal and then swings back to its position under the bottom of the die. So, the cycle time becomes a little longer. Schematic diagrams of the shot sleeve in an HPDC machine: (a) a horizontal shot sleeve and (b) a vertical shot sleeve. Correspondingly, some studies have been carried out on flow mechanisms of molten metal and optimum of shot profile for the horizontal HPDC process to reduce gas porosity. One research group, Lopez,10,11 Faura,12 Hernandez,13 and Zamora et al.14,15 investigated the wave dynamics and air entrapment mechanisms of molten metal. They developed an analytical model to predict the critical plunger speed, optimum acceleration, and other process parameters and then verified the optimum parameters for reducing air entrapment and minimizing gas porosity. Korti et al.16–18 studied the influence of process parameters on the evolution of interface aluminum liquid–air profile, and the parameters were optimized to minimize air entrapment. Fiorese et al.19,20 determined the plunger kinematic parameters, estimated their correlation with the casting quality, and then improved the quality by optimal plunger motion planning. Little work is available in the literature on the internal integrity of castings produced by the vertical HPDC process. Although the HPDC machine equipped with a vertical shot sleeve has not been widely used in the workshop, the advantages demonstrate that the unique process has potential competition in reducing air entrapment and oxide formation effectively in the vertical shot sleeve. The aim of this work is to study the quality of engine cover castings produced by the horizontal and vertical HPDC processes. First, some castings are produced using the two processes. Then, castings are selected randomly and checked by X-ray radiographic method to identify the porosity positions. Meanwhile, other castings are performed by T4 heat treatment process to evaluate blistering formation on the casting surface. Moreover, numerical simulations are implemented for the two processes to quantitatively evaluate the different effects of flow dynamics in the shot sleeve on porosity defects. The experiments were conducted under actual industrial production conditions. 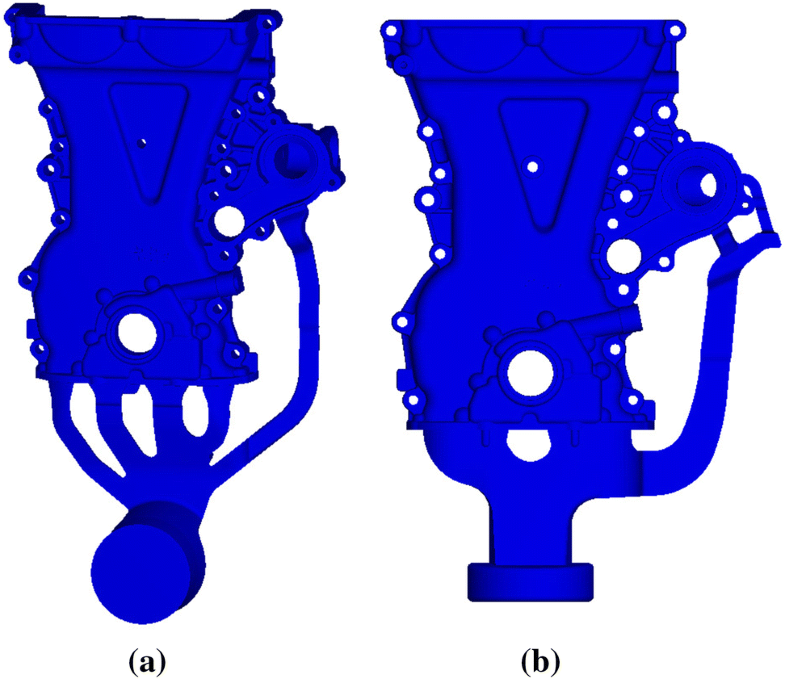 The casting used for this research is an engine cover with integrated pump body. 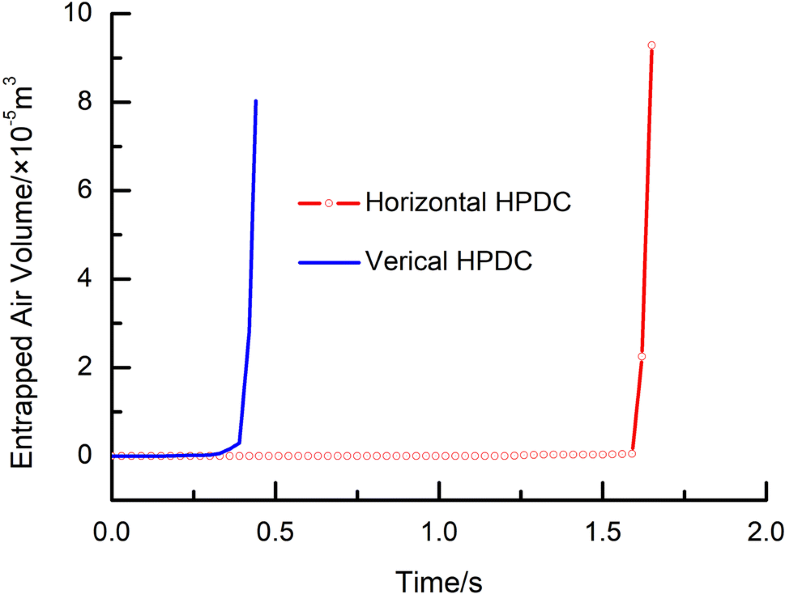 It is a component currently in production using the conventional horizontal HPDC process, as shown in Figure 2a. The casting shape is very complex, and especially, the wall thickness of the bosses around holes is very uneven. The alloy is aluminum, A380; the mass is about 3.0 kg. Issues with this casting are porosity defects and pressure tightness. The casting has to be scrapped if it fails the required X-ray radiographic inspection or the required leak testing after it is machined. The vertical HPDC process is designed and compared with the horizontal process in terms of porosity level and blistering formation in the castings. Casting and gating system: (a) the horizontal process and (b) the vertical process. 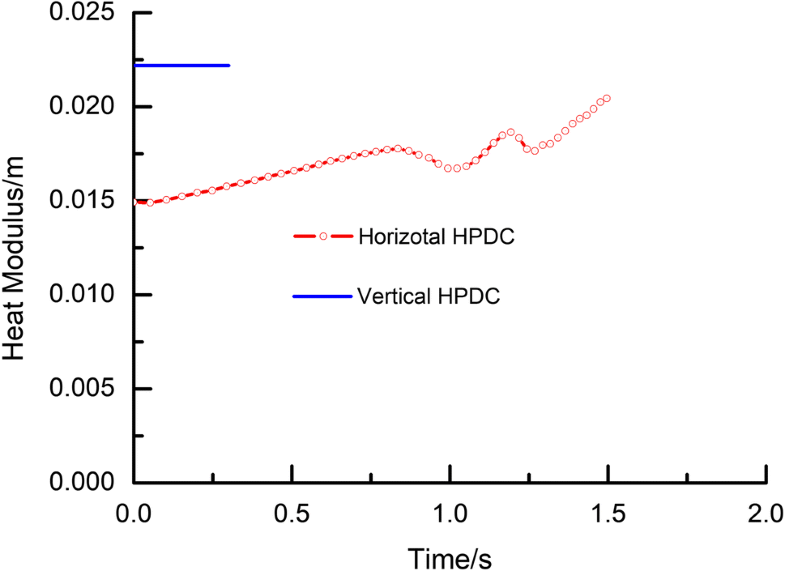 For the vertical HPDC process, the casting is gated from the bottom, as shown in Figure 2b. Because the vertical process was designed based on the horizontal process, the overflows, gating, and venting were accordingly modified in order to improve the casting quality. The detailed parameters of the two processes are listed in Table 1. The shot profiles are shown in Figure 3. The shot profile involves slow and fast shot stages, and the shift time from slow to fast shot is about 0.05 s. The horizontal shot sleeve is initially filled about 51.2%; the vertical sleeve is filled 100% at the beginning. The length of the horizontal sleeve is about 330 mm longer than that of the vertical one, which means longer filling time is needed for the horizontal process. So, the pouring temperature of the horizontal process must be higher about 50 °C than that of the vertical one. A single casting was selected randomly from each process, the horizontal and vertical process castings. 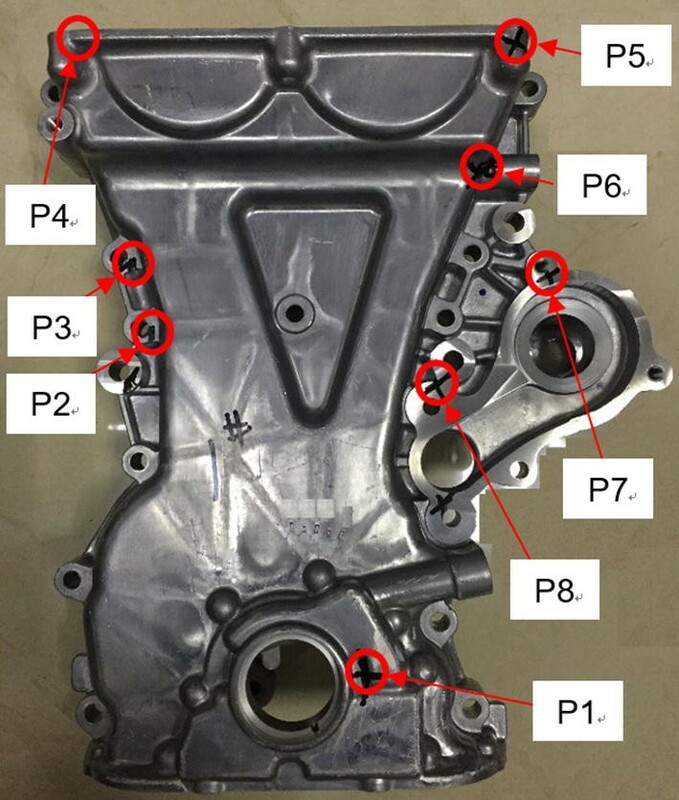 Both castings were inspected using an X-ray radiographic machine (Model XG-1604L/C) made by Shanghai Non-Destructive Equipment Company Ltd., China. The resolution of the machine is 0.5 mm. The entire casting was scanned to search for porosity defects, and some images were taken. Under as-cast conditions, porosities are usually found at the positions marked with P1 to P8 in Figure 4. For the casting produced by the horizontal process, porosities are found at all eight positions, P1 to P8, marked in Figure 4. However, for the casting made using the vertical process, porosity is found only at the position, P8. Indeed, much fewer porosities have been detected in the castings made using the vertical process than that using the horizontal one. The inspection results can be translated into decreasing scrap rate for castings made using the vertical process. 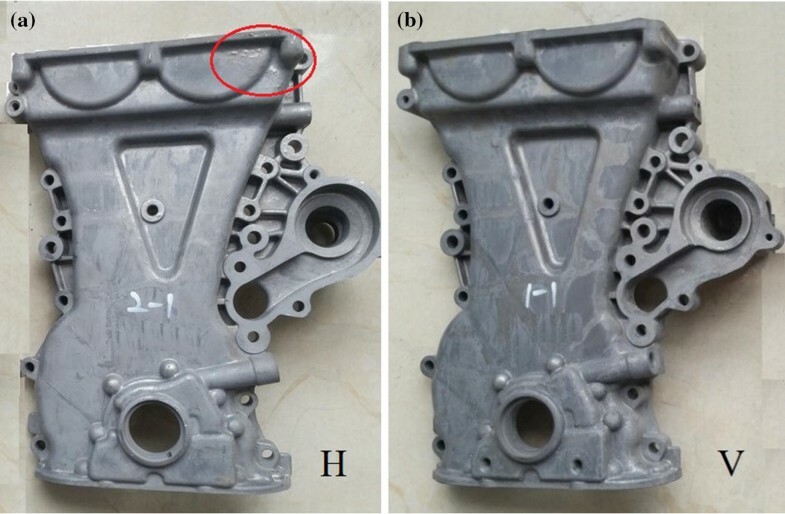 Only X-ray radiographic inspection results at two positions, P2 and P8, in two kinds of castings are shown in Figure 5. The red circles mark the pores found on the images of Figure 5a, c, and d.
X-ray images at the positions, P2 and P8: (a), (c) a horizontal HPDC casting; (b), (d) a vertical HPDC casting. It has to be noted that the resolution of X-ray radiographic inspection is limited. Pores or voids smaller than 0.5 mm cannot be observed. Two castings were selected randomly from the horizontal and vertical process castings, respectively. Then, T4 heat treatment process was performed to evaluate blistering formation in both castings. The castings were heated up to 530 °C at a rate of 20 °C/min., held at 530 °C for 2 h, and then quenched in water. Photographs of blisters on the casting surface are taken, as shown in Figure 6a, b. It can be seen there are more severe blisters on the surface of the horizontal HPDC casting than that of the vertical one, especially in the red circle in Figure 6a, and the blisters are more severe which indicates too much air was entrapped into the horizontal HPDC casting during filling process. Blisters in castings: (a) a horizontal HPDC casting and (b) a vertical HPDC casting. Numerical modeling was established using FLOW3D CAST software to quantitatively compare the different effects of flow dynamics and solidification process on porosity defects between the horizontal and vertical processes. The detailed parameters listed in Table 1 were used as initial and boundary conditions in the modeling. The transition from slow shot to fast shot was assumed to be at the point when the liquid metal reaches the in-gate for the horizontal process, and was at the point when the liquid metal passes the in-gate by 10 mm for the vertical process. Since the geometries of the castings and the gating systems are very similar to the two processes, the simulation is focused on the flow dynamics of molten metal in the shot sleeve. 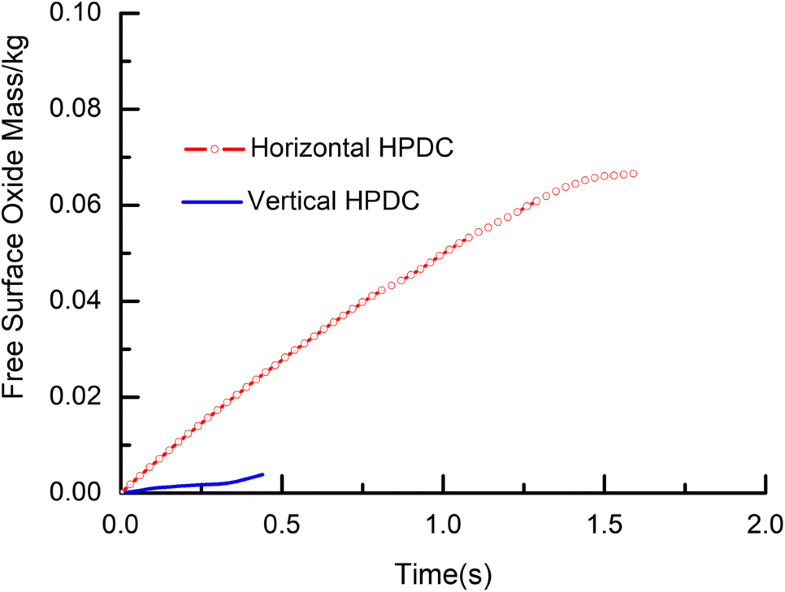 The entrapped air volume under the standard state can be solved based on the filling simulation results, and the corresponding curves can be plotted for the horizontal and vertical processes, as shown in Figure 7. It can be seen that the entrapped air volume almost keeps zero during the slow shot stage for both processes. While at the beginning of the fast shot stage, some air is obviously entrapped into the molten metal because of severe turbulent flow, and the volume of air entrapment increases sharply. The maximum volume of air entrapment is about 9.4 × 10−5 m3 for the horizontal process; it is about 8.0 × 10−5 m3 for the vertical process. Meanwhile, the filling time of each process can be known from Figure 7; for the horizontal process, filling time is 1.654 s; for the vertical process, filling time is 0.441 s.
For the horizontal process, wave formation occurs in the shot sleeve because of turbulent flow, as illustrated in Figure 8, while there are no obvious waves in the vertical shot sleeve due to gravity. Molten metal in a horizontal shot sleeve. According to simulation results, the height of wave can be calculated in a horizontal shot sleeve with the plunger moving toward die cavity, as illustrated in Figure 9. As soon as the plunger starts to move, a wave is formed ahead of the plunger. The height of the wave, defined as the height of the wave from its valley to its peak, is quite stable at about 0.02 m tall before the time, 0.8 s. But when the molten metal reaches the entrance to the runner at about 0.9 s, as shown in Figure 10, the molten metal starts to jump up and down due to wave action, just like the red circles marked in Figure 10, and it causes unstable waves up to about 0.093 m tall at the entrance of runner. This is similar to what we usually see in a lake. As small waves reach the shore, they crush and form much larger splashing waves. Such turbulent motion of the liquid front ought to cause issues with oxide formation and the entrapment of both air bubbles and oxides. Simulation results of wave formation at different times. For the horizontal process, with the plunger moving forward, the molten metal is pushed toward the die and eventually fills the cavity. In this period, the free surface area of molten metal varies with time, as shown in Figure 8. For the vertical process, when the plunger pushes molten metal upward to the die cavity, the free surface area is basically equal to the section area of the shot sleeve or runner due to gravity. Based on simulation results, the free surface area of molten metal can be solved for both processes before molten metal reaches the in-gate, as shown in Figure 11. The red curve is the simulated results in a horizontal shot sleeve, and the zigzag nature of the curve reflects turbulent flow and wave formation from time to time. The purple curve is the theoretical results which assumed that the slow shot is so perfect that there is no turbulence and wave formation. Compared with the red and purple curves, any turbulent flow such as wave formation is going to increase the free surface area. As a result, the real free surface area curve for any shot profile should fall above the theoretical curve. Meanwhile, the blue curve is the simulated results in a vertical shot sleeve where the free surface is the top surface of the molten metal. As a result, the curve is firstly a straight horizontal line until the top surface of the molten metal reaches the runner. Then, the free surface area is reduced to the runner section. When the molten metal is initially poured into the sleeve, the simulated free surface area in a horizontal sleeve is about 0.0611 m2; the corresponding theoretical value is about 0.0591 m2. Meanwhile, in a vertical sleeve, it is only about 0.0102 m2. So, the free surface area of molten metal in a horizontal sleeve is about 6 times higher than that in a vertical one. Aluminum alloy is an oxidized material; a thin layer of oxide film is easily formed on the free surface of molten metal in a shot sleeve during the filling process. 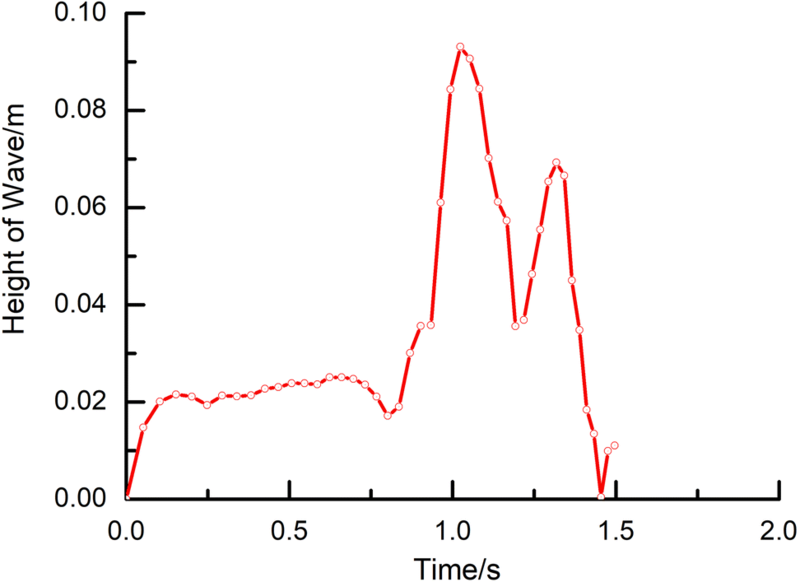 Based on simulation results, the oxide mass originated from turbulent flow and wave formation for the two processes, as shown in Figure 12. The two curves are completely different. It can be known from Figure 11 that the free surface area in the horizontal sleeve is about 4–6 times than that of the vertical one during the slow shot stage. Moreover, severe turbulent flow and unstable wave could break up some old oxide films from time to time, thus bringing in more new oxide formation in the horizontal sleeve. It can be known that the maximum oxide mass is about 0.067 kg for the horizontal process, while it is only about 0.0039 kg for the vertical process. So, the ratio is about 17.2 times. Free surface oxide mass curves. where V is the volume and S is the total surface area of the molten metal. The larger the heat modulus, the smaller the temperature gradient or cooling rate of molten metal. It means the heat of molten metal releases slowly, and it is beneficial to hold the metal above liquidus temperature of the alloy. According to simulation results, heat modulus curves in a shot sleeve can be plotted for the two processes, as shown in Figure 13. It can be known that the value of M varies from 0.0149 m to 0.0205 m for the molten metal in a horizontal shot sleeve, while it is about 0.0222 m in a vertical one. So, the heat modulus of molten metal for the vertical process is about 1.1–1.5 times larger than that of the horizontal one. Solidification simulation provides shrinkage porosity results, as shown in Figure 14. It can be known that the positions and sizes of shrinkage porosity are very similar to the two processes, and most porosities occur in the overflows and runners. Combined with Figure 4, shrinkage porosity most likely occurred at the position P8, and secondly at the position P2. Compared with Figures 5 and 6, it is well known that experimental difference of porosity defects between the horizontal and vertical processes mainly lies in gas porosity which was induced by air entrapment and oxide formation during filling process. Shrinkage porosity: (a) a horizontal HPDC casting and (b) a vertical HPDC casting. 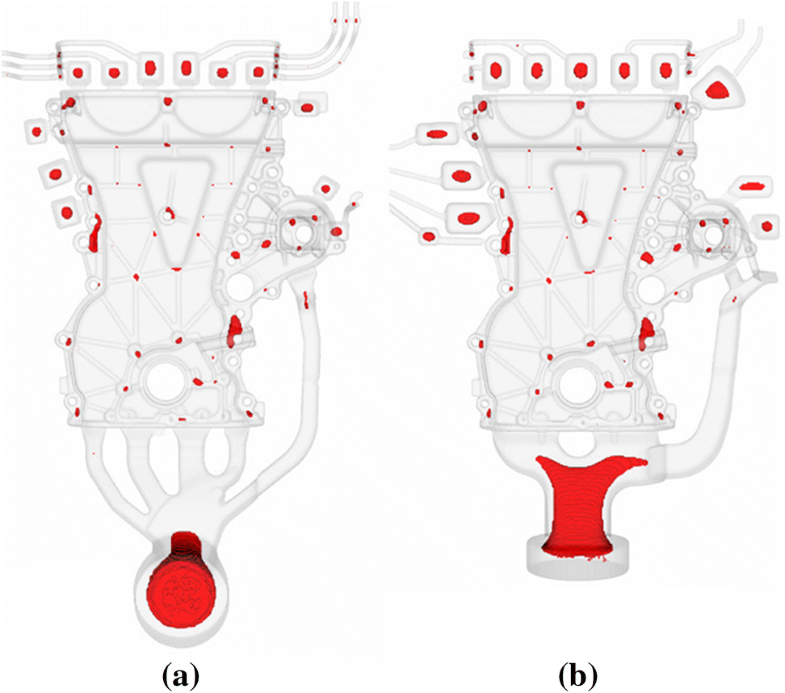 Based on above experimental and simulation results, the different effects of casting parameters on gas porosity defects between the horizontal and vertical processes can be evaluated comprehensively. Gas porosity mainly results from three factors: (1) air entrapment, (2) oxidized formation, and (3) premature solidification or cold flakes in the shot sleeve.21–23 The possibility of shrinkage porosity distribution is very similar to the horizontal and vertical processes according to the simulation results shown in Figure 14. Meanwhile, combined with the experimental results shown in Figures 5 and 6, it can be inferred that gas porosity is more vulnerable to occur in the horizontal process than in the vertical one. On the one hand, the modification of overflows, gating, and venting is beneficial to avoid air entrapment; on the other hand, the vertical shot sleeve can effectively reduce oxide formation with the decreasing of turbulent flow, wave formation, and wave reflect. The influence of these three factors on gas porosity can be quantitative interpreted based on simulation results. First, as for air entrapment, it can be known from Figure 7 which indicates entrapped air volume of the horizontal process is about 1.2 times than that of the vertical one. Second, as for oxidized formation, it can be analyzed comprehensively from Figures 8, 9, 10, 11, and 12 which demonstrate free surface oxide mass of horizontal process is about 17.2 times than that of the vertical one. For the horizontal shot sleeve, flow turbulence brings in wave formation, as illustrated in Figure 8. When the wave moves forward and reaches the entrance to the runner, it will be reflected and jump up and down. Then, severely unstable waves occur, as shown in Figures 9 and 10. Meanwhile, the free surface area of molten metal in a horizontal shot sleeve is about 6 times larger than that in the vertical one when the molten metal is initially poured into the shot sleeve, as shown in Figure 11. Thus, in a horizontal shot sleeve, as the plunger starts to push liquid metal forward, the free surface area of molten metal creases linearly, indicating that the oxide film on the molten metal has to be broken up. As a result, new oxides are formed instantaneously at the positions where old oxides are fractured. The fragments of the oxide can be entrapped into molten metal. While oxide entrapment is unlikely to occur in a vertical shot sleeve because there is almost no obvious wave formation. Once oxide film is formed, it is unlikely to be broken up. In fact, the oxide film, undisturbed, should be useful in preventing further oxidation of the molten metal and in protecting the molten metal from absorbing hydrogen from moisture or gases in the shot sleeve. Therefore, much less oxide is formed in a vertical shot sleeve than that in a horizontal one, as shown in Figure 12. Finally, as for premature solidification or cold flakes, it can be seen from Figure 13 that the unique feature of the vertical process is a smaller amount of heat loss of molten metal than that of the horizontal one because of the larger heat modulus. The benefits of having a larger modulus for the vertical process include (1) lower pouring temperature, which is beneficial for not only the service life of shot tooling and dies but also the decrease of hydrogen solubility in molten metal24, 25 and (2) fewer cold flakes and less pre-solidified metals in the shot sleeve. Cold flakes and pre-solidified solids will bring in porosity and then deteriorate the mechanical properties because of larger dendritic length scares and oxide formation on the surfaces of cold flakes. 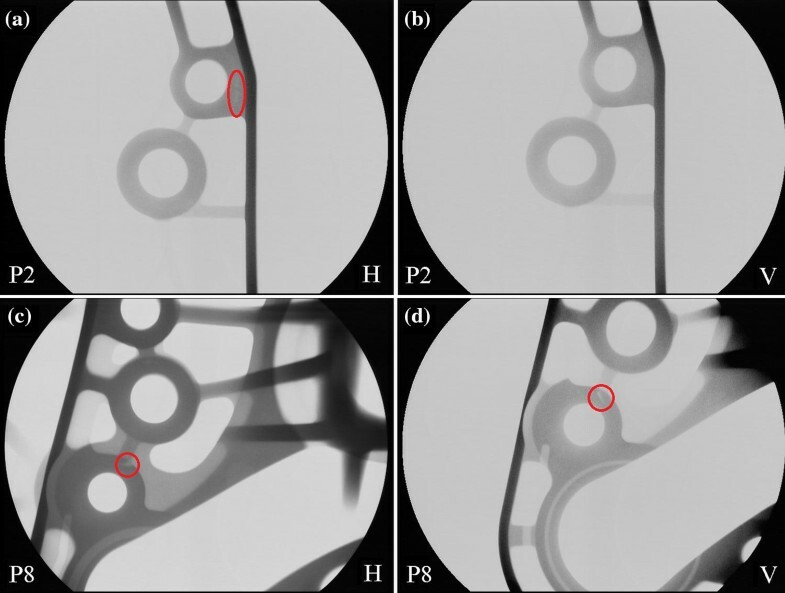 The experimental results of X-ray radiographic inspection and T4 heat treatment process indicate that castings made using a vertical shot sleeve process contains fewer porosities and blisters. Numerical simulation results suggest that the free surface area of molten metal in a shot sleeve is much smaller for the vertical process than that of the horizontal one. Waves are formed in the horizontal shot sleeve because of turbulent flow. Wave formation and wave reflect both cause entrapment of gases and oxides that increases the porosity level of the castings made using the horizontal process. While for the vertical process, the shot sleeve is always completely filled and the flow in the molten metal is less turbulent. As a result, less oxide and mold gases are entrapped in the vertical shot sleeve. Numerical simulation results also demonstrate that the heat modulus of molten metal is higher in the vertical sleeve than in the horizontal one. Consequently, liquid metal can be poured into the shot sleeve at a lower temperature for the vertical process, which means that less hydrogen, pre-solidified material, and cold flakes are formed in the vertical shot sleeve. The authors gratefully acknowledge financial support from Fiat Chrysler Automobiles LLC under the R&D project Agreement No. 00059689.